With its dazzling skyscrapers set against the more traditional backdrop of Vietnamese pagodas, temples and colonial architecture, you and your family will get a taste of both modern and ancient when visiting Ho Chi Minh City. Also known as Saigon, the rich culture, aromatic foods and hustle and bustle of the city will make this a memorable stop you and the kids won’t soon forget. The contributor of this post is an established American writer who writes her own blog on single parenting. If you’re thinking of traveling to Ho Chi Minh with your family, here are some things to do and ideas for places to stay. If it’s in your budget, find a hotel with a pool, as it will give you and the kids something to do when you’re ready for some down time away from the activity of the city. 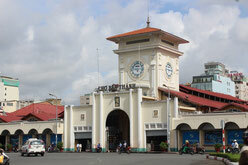 Tourist hotels abound in the area around Ben Thanh Market, including Saigon Village and Somerset, both popular among foreign tourists and tourists with families. Anywhere you stay though, expect to get special attention -- mostly because you’re traveling with kids. Your Vietnamese hosts will be delighted to show your kids around and spoil them a little -- it’s part of the culture. Before you book though, ask how many people the rooms can accommodate, as not every room is suitable for a family larger than three people. If not, book two adjoining rooms or ask for an extra bed. 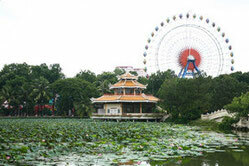 Ho Chi Minh offers no shortage of things to do; even people watching is an activity you should reserve time for. Don’t miss the Ben Thanh Market, where you and the kids can pick up souvenirs for your family back home, sample some of the more off-the-wall foods that Vietnam has to offer, or get supplies you need for your time on the road. In short, Ben Thanh Market has it all. Do bargain for the best deals. For a more idyllic look into Ho Chi Minh city, book a tour to the iconic Mekong Delta just outside of Ho Chi Minh, where you will enjoy a lesiurely broat cruise across the vast Mekong river. What's more, you will have the opportunity to explore the local villages, and to interact with the locals, who are just bursting to share their lives as river dwellers. For entertainment geared specifically for children, be sure to visit Bing Quoi Tourist Village, where there’s nightly entertainment, puppet shows, water cruises and buffet-style meals. While we’re on the topic of amusement parks, also worth a visit is the Dam Sen Water Park, filled with waterslides, a kids’ pool and a playground. 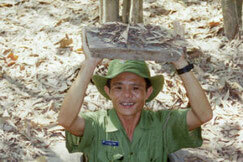 Also not to be missed is a tour into the Cu Chi tunnels -- the thoroughfares for Viet Cong soldiers during the Vietnam war. Inside these tunnels you’ll get a taste of recent history. If you have history buffs or lovers of all things military among your family, also check out the War Remnants Museum -- though as a word of warning, it’s not for the faint of heart. 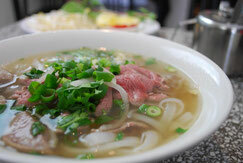 Eating in Vietnam is a treat to the senses, with a host of new flavors and exotic fruits and vegetables. The adults and older kids in your family may be ready for the culinary adventure, but if your little ones aren’t quite ready for all the changes, you’ll find supermarkets that stock items you’re used to back home. In addition, it’s not difficult to find fresh fruits, ice cream and delicious breads that will feed the more picky eaters among you. Start them off slowly and soon you may find them delighting in Pho, the delicious local soup, like the rest of the family. 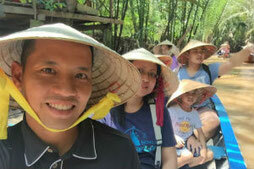 When you’re ready for an adventure that’s filled with wonder and is affordable and accessible for the entire family, Ho Chi Minh should definitely be on your list. As with any place you travel with kids, take it slow and don’t pack in too much in any given day and you and the family will truly enjoy your Vietnam adventure. When you are looking for a writing service, you are definitely going to make sure that you are being given 100% original work and this is the reason that we only provide customized essays. All draftings are done from a complete scratch. We dont sell papers that are pre-written. To tell you further, each and every essay has to pass through different plagiarism checks because we dont compromise on it. You can just forget about all your worries by knowing that all your work will be completed with high standards.